Joan here. As usual, I keep procrastinating these blogs and I apologize for that. I know I’ll need to get better at this because the longer I wait, the less I’ll remember. But don’t you worry. I will never forget how awesome or bad the ramen tasted. Some of you know that I went back to Oahu, Hawaii a few weeks ago. I brought along my boyfriend, Sean. 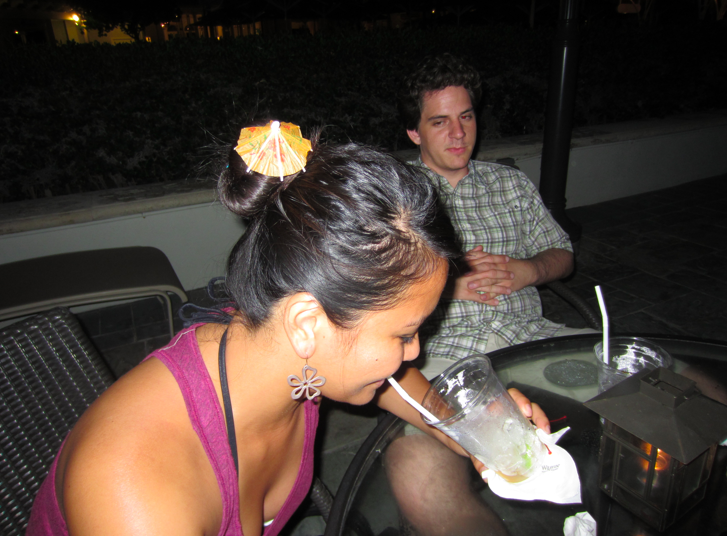 He’s been to Oahu before, but going with me gave him a chance to experience the island the way locals do. 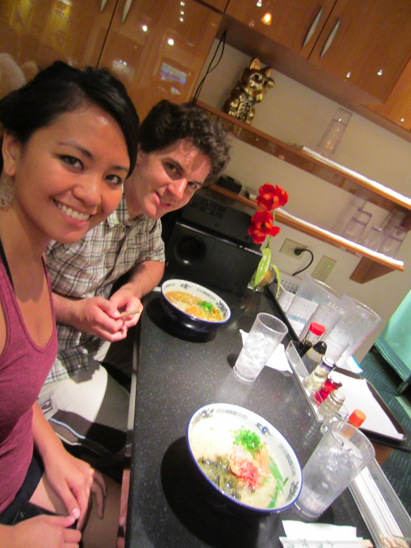 And of course, we couldn’t leave without having a ramen run. 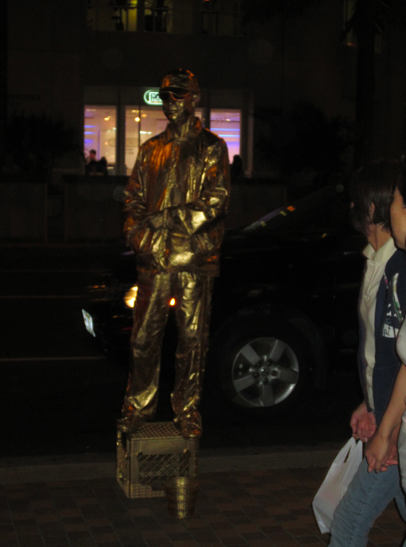 During one of our last nights in Hawaii, we cruised down the Waikiki strip. That was something Tanya and I didn’t get to do. 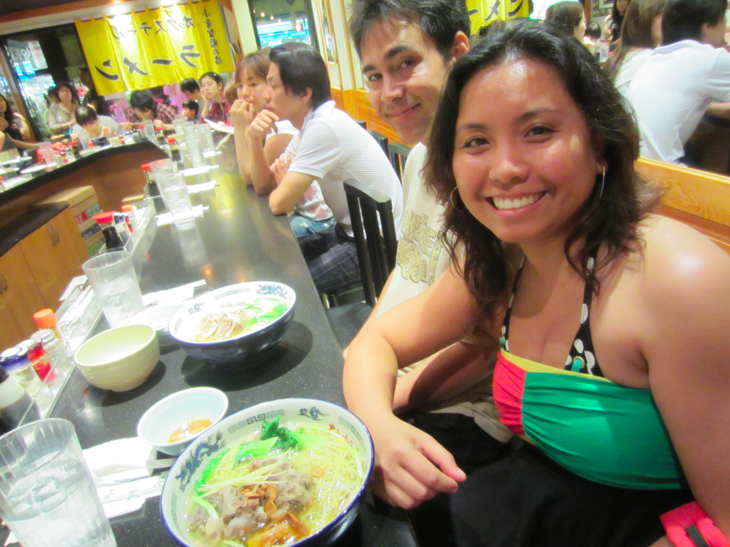 The great thing about the Waikiki strip, was that ramen houses were all over! 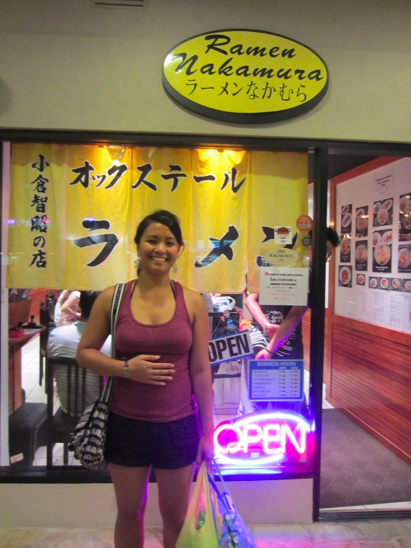 I went on Yelp to read up on the ramen houses and came across a place called Ramen Nakamura. Everyone seemed to rave about it and based on what I read, it was the most authentic style ramen on the strip. The not-so-great thing about Waikiki is finding parking. We had to park more than a mile from Ramen Nakamura. But that’s okay. It was in the evening and Waikiki was still full of life. There were definitely a lot of cool and weird things to see. The funny thing about the strip is that you will definitely see an ABC store at every block. There were blocks that had two! Talk about tourist traps! Another strange thing I noticed was that the ramen shops were located between high-end stores like Coach, Gucci, and Versace. Ramen isn’t exactly expensive food! 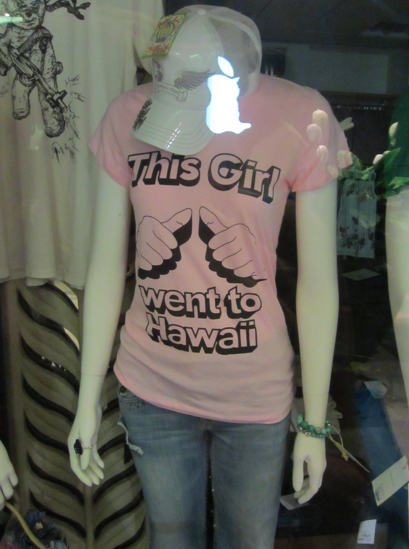 Yep, this girl went to Hawaii. Again. 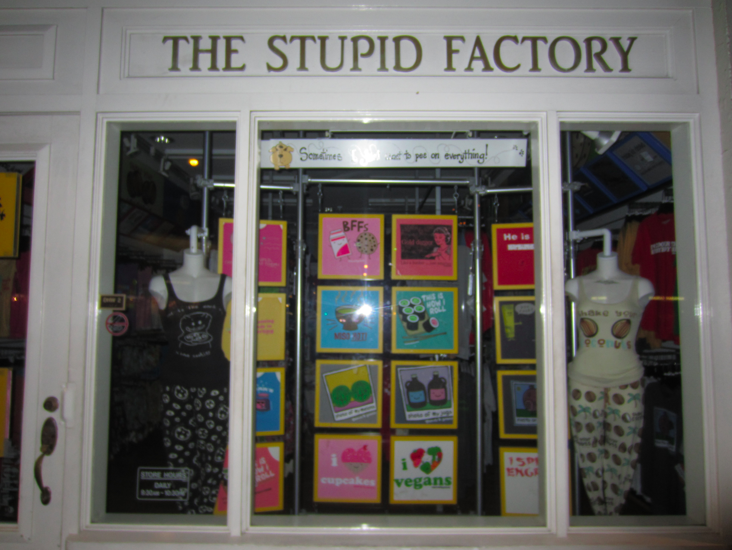 Funny shirts from the Stupid Factory. 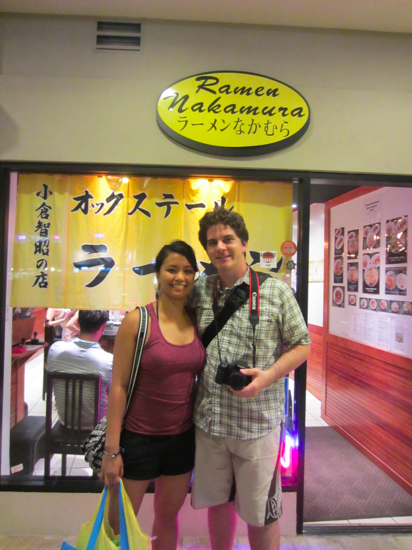 After all that walking, we made it to Ramen Nakamura and there was a very short line. The place was full and seated about 15 people. Luckily, a lot of people were finishing up their dinners so we waited for only 10 minutes. 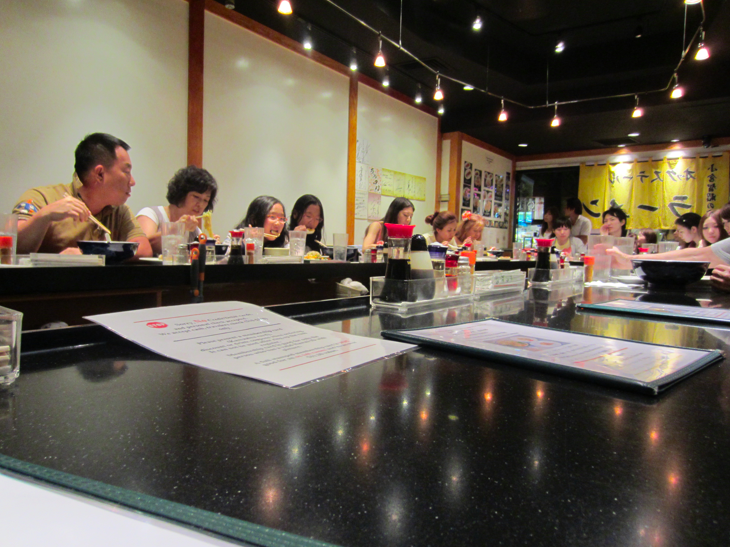 As soon as we were seated, a line of 20 people showed up at the door. I swear, we got lucky that night. My lovely sister, Frances, and her totally cool husband, Patrick. The ramen house was pretty small, like most ramen places. The seating was just one large horse-shoe shaped table. It was cool that you get to see everyone you’re eating with, but not so cool when you’re seated in front of a family with a crying baby. The menu… isn’t very clear. Sorry. 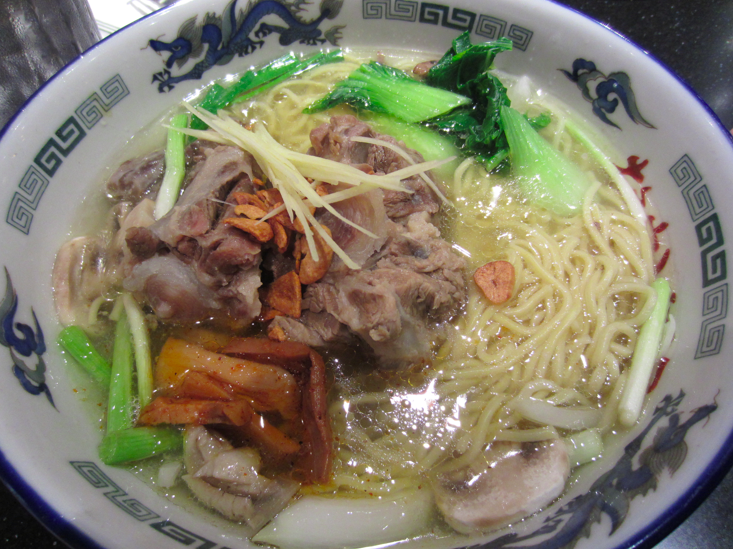 Ramen Nakamura is famous for the oxtail soup. I’m not really a fan of oxtail soup so I ordered the hakata ramen. 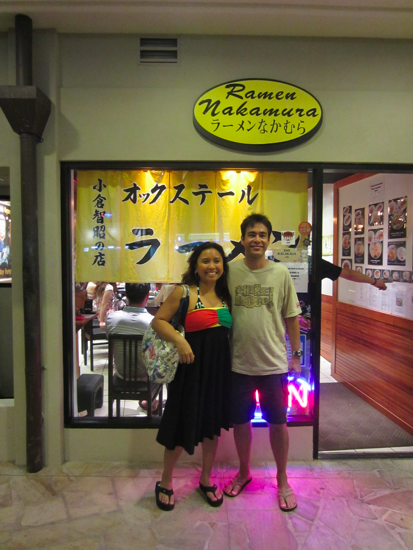 I was surprised that they even had it because the last time I visited Hawaii, none of the ramen shops served hakata ramen! My sister and her husband both ordered the oxtail ramen and I got a taste of it just so I can say I tried their specialty. Sean ordered the shoyu ramen. I seriously found one of the best bowls of ramen I’ve ever had! First of all, the broth was perfectly flavored. 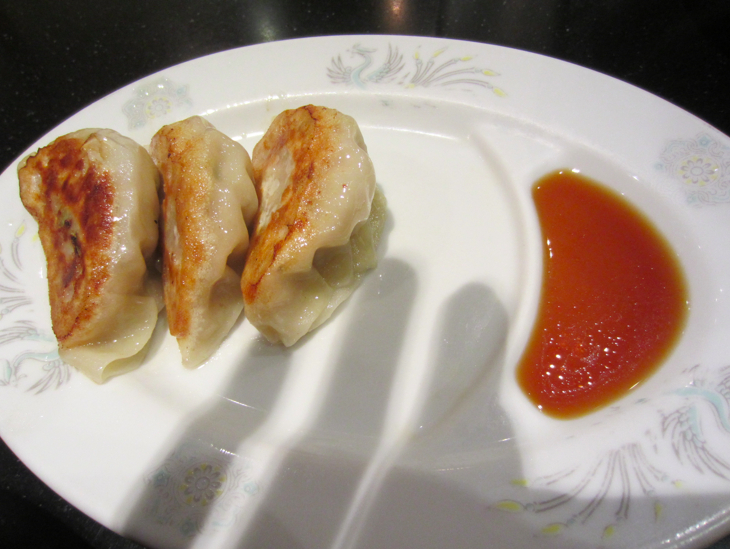 It was not that salty, it definitely did not use MSG and the pork flavor was at the perfect strength. Second, the noodles were at medium firmness and tasted good. They didn’t taste like they came out of a top ramen bag. (sorry, but that’s the best way I can describe noodles) The pork slices were nice and tender with just enough fat attached and the bowl was not filled up with oil. Again, I forgot to ask to have the bamboo removed, but the rest of the garnishing was a good combination. It had toasted garlic which added to the flavor of the broth, chopped green onions, ginger, and I think the dark green stuff was bok choy. I added a bit of sesame oil just because I love the sesame flavor. The one thing that made this place extra amazing was the service! Yes, we were lucky to be seated right away because of our timing. But the lady who was our server seriously ran this place like those Diner Dash games. She was the only server there and all the seats were filled. We didn’t even have to ask her for water and she served us water anyway. Our orders were served within 10 minutes. She was very efficient in taking orders and cleaning up the table but at the same time, very attentive to all the other customers. AND she had a smile on her face the entire time. She was awesome. We tipped her very well. 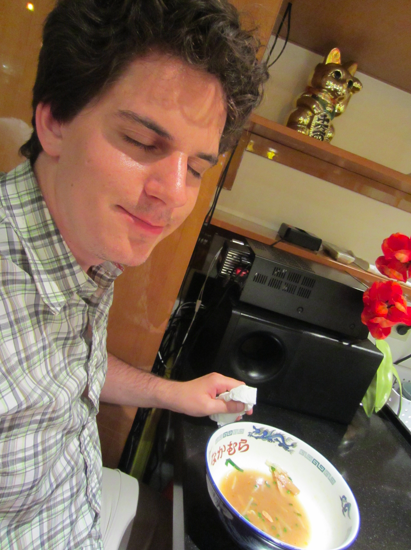 Sean was having food coma. 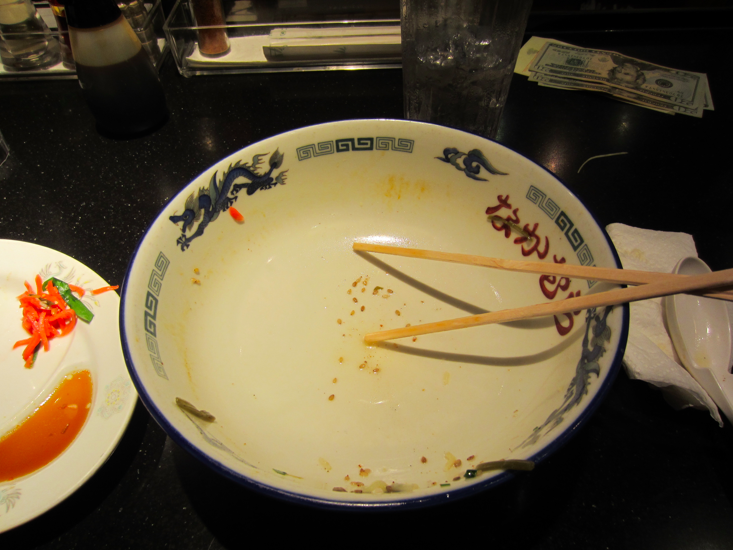 It’s been a while since I’ve had my bowl of ramen look like this in the end. 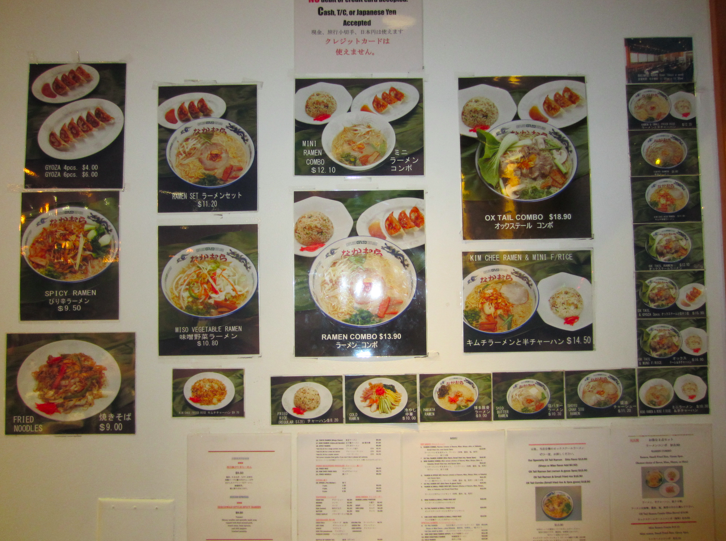 This ramen house comes pretty close to my favorite ramen house, Shin Sen Gumi in Fountain Valley. 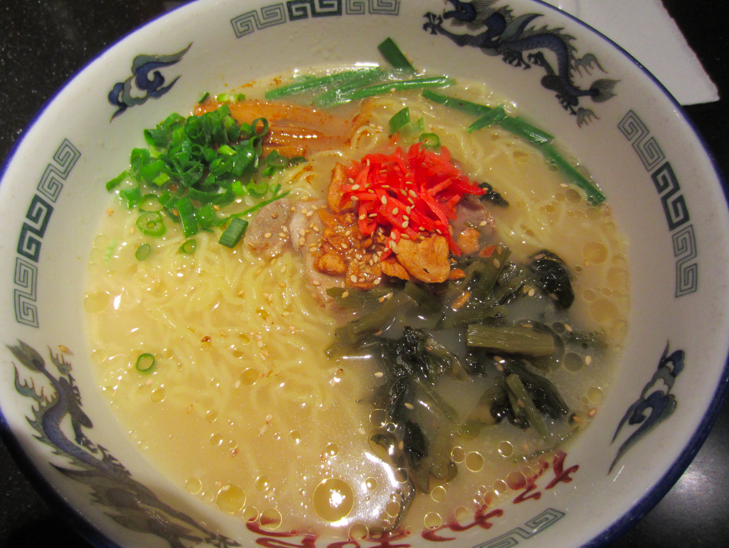 My ramen at Nakamura’s was exactly how I would order it at Shin Sen Gumi. (without the bamboo and ginger of course) It’s pretty hard for me to decide if this is my number one ramen so far or if Shin Sen Gumi is still the one. Consistency would definitely make that decision, if only I can travel to Hawaii every month… I’m dreaming here! 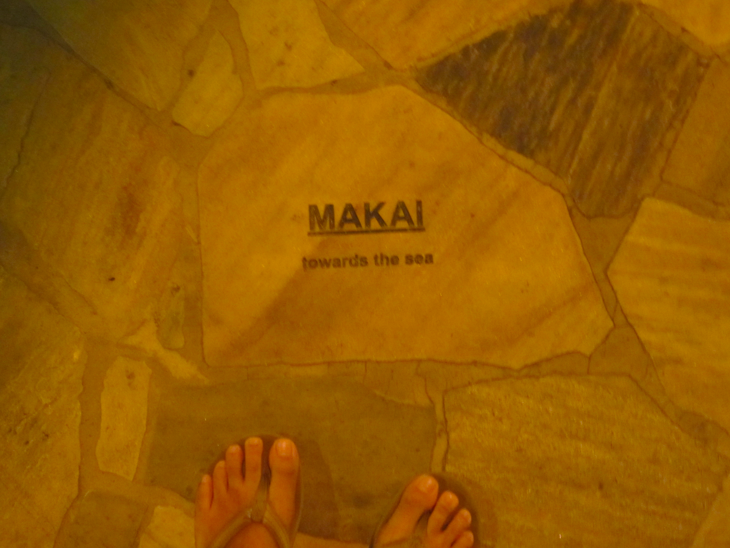 After a very satisfying dinner, we headed towards the sea…. 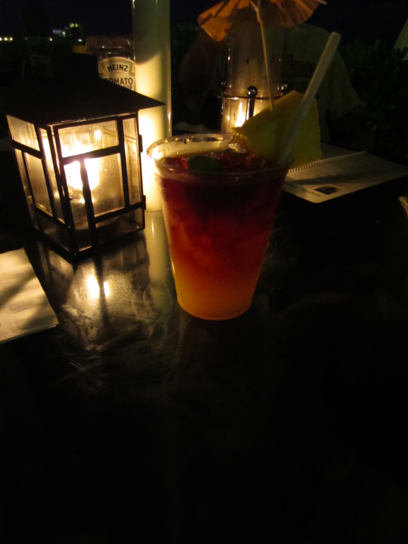 We ended up at the Moana Surfrider hotel in Waikiki and had drinks at their Beach Bar for some Mai Tai’s. It was pretty good but very strong. If you’ve seen Audrey Tautou’s film “Priceless,” you’d understand what’s going on here. 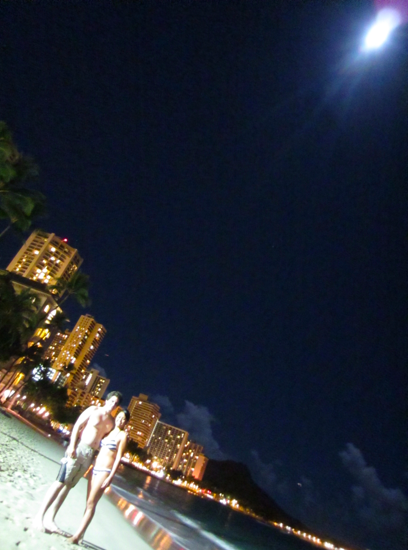 Waikiki Beach at night looks awesome. Hawaii will always be a great place to visit if you love the beach and you love great food. I was glad to do some of the same things I did before, and also a few new things. I also got to hang out with a bunch of my friends that I haven’t seen since middle school! Sean had a really great time and I’m glad he got to see Hawaii the way I did growing up here. Just so you know, it’s been 3 weeks since I started this blog. I’m really sorry for taking this long but… life and laziness gets in the way. But thanks for reading and I hope that our readers can one day sit down with Tanya and I for some ramen. Was it an epic surfing accident? 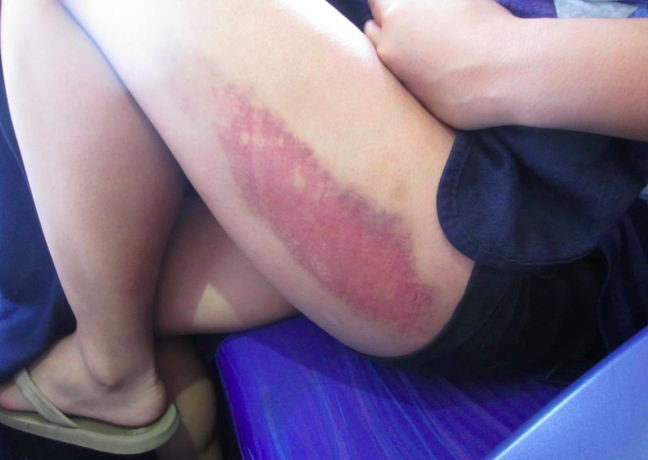 Was it a bad fall during our hike up the mountain? Was it from getting into a fight with some local girls because I didn’t look local enough? I’ll let you figure this out!